Lourenco, a former defense minister who became president last year, on Tuesday hosted members of Angolan civil society organizations at the presidential palace to discuss education and other ways to improve the country, long plagued by corruption and human rights abuses. Lourenco has sought to distance his administration from his former boss, removing dos Santos' children from powerful government posts and opening the way to corruption cases against them. Activist Sergio Calundungo welcomed what he called a "symbolic meeting" that indicates Lourenco is "not afraid to dialogue," according to Agencia Angola Press, the state-run news agency. Luaty Beirao, a rapper jailed during the dos Santos era, tweeted that he had expected the meeting to be a positive gesture rather than a "magic wand" that would wave away the southern African country's problems. 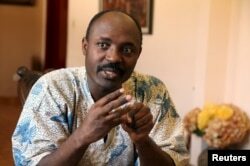 FILE - Journalist Rafael Marques de Morais is interviewed at his home in Luanda, Angola, May 12, 2015. One of the Angolan state's harshest critics was barred from the meeting. However, journalist and activist Rafael Marques de Morais said there had been a "misunderstanding" and at a private meeting with Lourenco on Wednesday he discussed corruption, human rights and other issues, state media said. "I believe in the goodwill of the president," Marques said earlier on Maka Angola, a website that he founded to highlight alleged government corruption and other concerns. He said he planned to raise the "main concerns" of people in Angola, where poverty is widespread despite the country's status as one of Africa's top oil producers. In an October article in Maka Angola, Marques noted "encouraging signs" in Lourenco's anti-corruption drive, including the arrest of Jose Filomeno dos Santos, son of the ex-president and former head of Angola's sovereign wealth fund. However, Marques wrote: "Bringing so many rich and powerful criminals to justice is complicated by the fact that so many retain positions of political or military power." Jose Eduardo dos Santos, who took power in 1979 amid a civil war, stepped aside as president after elections last year. He quit the post of ruling party leader in September, saying he had made mistakes but was leaving with his "head high."